The University of Wolverhampton has revealed the findings of its recent research project to understand what specific smells belong to the Black Country, and what memories they evoke in Black Country locals. In partnership with Black Country Living Museum and Wolverhampton Art Gallery the University of Wolverhampton secured £2,200 funding to undertake pioneering research that explores past and present smells of the Black Country in relationship to childhood memories of people living in the region. Two community research events – entitled ‘Snidge Scrumpin’ – were held at Black Country Living Museum and Wolverhampton Art Gallery in November 2018 as part of the Being Human Festival, the only national festival of the humanities in the UK. University Psychologist Dr Tom Mercer analysed the data collected at both events to reveal which particular Black Country smells resonated with the participants, and which odours triggered strong, emotional memories with the locals. Senior Lecturer in Teaching of English for Speakers of Other Languages (TESOL), Judith Hamilton, looked at the language participants used to describe the odours used in the experiment. In Black Country dialect, ‘Snidge’ means ‘nose’ and ‘Scrumpin’’ is ‘foraging’. The events, themed around ‘origins and endings’, were selected to be part of Being Human by the festival organisers, the Arts & Humanities Research Council (AHRC), the British Academy (BA), and the School of Advanced Study, University of London (SAS). The events were part of a 10 day national programme of big ideas, big debates and engaging activities for all ages, champion excellence in humanities research in the West Midlands. Sebastian Groes, Professor of English Literature in the School of Humanities at the University of Wolverhampton, said: “Smell is unique because it has the ability to take us right back to our childhood. 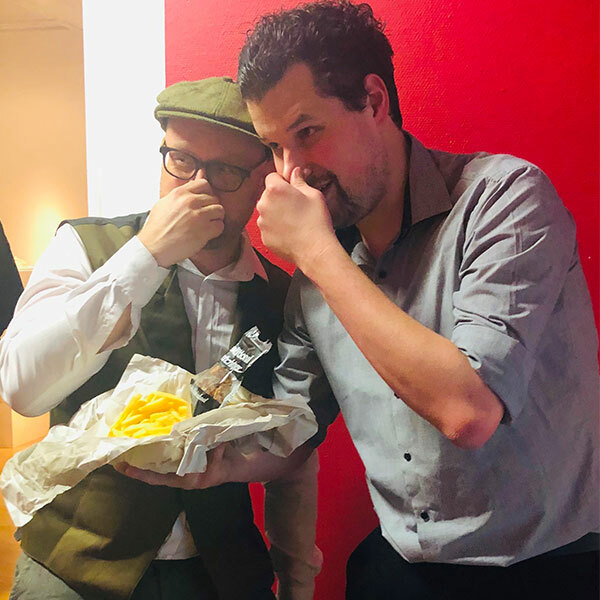 The two Snidge Scrumpin’ events looked at mapping the specific smells that belong to the Black Country by asking participants to smell odours that had been captured by our researchers. “The community events were designed to build on research into the so-called ‘Proust Phenomenon’, which suggests that odours can trigger childhood memories. We conducted an interactive psychological experiment and people that attended were asked to retrieve and describe their memories, rate their intensity and emotionality as well as pin point on a map where they experienced the smell. Snidge Scrumpin’ is a pilot project for nationwide research into the creation of a UK map of smell and memory. Picture shows Professor Groes left and Dr Mercer right.